Mongar is situated on a hill top (altitude 1600 m) like most of the prominent towns and villages of Eastern Bhutan. In fact, Mongar denotes the beginning of Eastern Bhutan. Mongar is known as a famous shopping destination for dwellers of Eastern Bhutan and is also the district head quarter. When in Mongar, you will hear at least 3 to 4 different dialects. The population is ethnically diverse. The Khengpa, Kurotep and Tsangla group dwell here in perfect harmony. One of the most beautiful features of the town are the stately eucalyptus trees lining the town on all sides… they add to the aesthetic value and protect the town from harsh winds. The homes in the pretty town of Mongar are mostly made of stone while the facades and verandas are made of wood. The weavers in Mongar are famous for their skill and fabrics produced here have been imported to many major fashion hubs of the world. The wood carved products of Mongar are also very famous. Incidentally Mongar is known as the Zhongarp Bastion as it produced some of the best administrators in the country. The descendants of Mongar still play an active role in the political landscape of Bhutan. The journey to Mongar is high drama and you will pass over steep cliffs and through verdant forests along with wide pastures. You will also pass through the road that leads to the famed rhododendron garden… blooms of every colour compete against each other in their loveliness. If you are lucky and the sky is clear, then you can also catch a glimpse of the Gankhar Puensem that’s the world’s steepest uncharted mountain (7541 meters). The Bhutan Government is quite strict about the number of tourists who enter and leave Bhutan and you will require separate permits and in some cases government attendants. However, your chosen tour operator will take care of these arrangements. Dhug Transport operates a bus service to Mongar from Thimphu every Tuesday, Thursday and Sunday while Meto Transport operates a service from Mon, Wed and Friday. The buses leave Thimphu at 7 a.m. and reach Mongar at 5.30 p.m. From Samdrupjongkhar terminal (another entry point in Bhutan via Indian Border), a Bumba Transport coaster bus runs daily (except Sundays) to Mongar. However, this bus takes 11 hours to reach Mongar. From Trashigang a bus runs from 1 p.m. and reached Mongar at 5.30 p.m. From Lhuentse a bus runs everyday at 7 a.m. and reaches Mongar around 11.30 a.m. Since Trashigang and Lhuentse are significant tourist destinations and bus service to and from these places are regular… you can consider taking the bus instead of a taxi when covering these places. From Trongsa to Mongar the distance is 222 km (takes about 7 hours) and the cab fare is 4437 NU while from Wangdue to Mongar the distance is 322 km and the cab fare is 5630 NU. From Bumthang to Mongar the distance is 174 km and the cab fare is 3281 nu. From Trashigang to Mongar the distance is 88 km and the cab fare is 1720 NU. It will take you a lot of time to reach Mongar (central Bhutan) from Thimphu in Western Bhutan as the distance is 414 km while the fare is 7036 NU while from Paro the distance is 456 km (fare 8000 nu approx.). Unlike Paro and Thimphu, Mongar is remote and not many conveyance options are available. Mongar Dzong was built as a substitute to the beautiful Shongar Dzong that was tragically destroyed by a fire in 1929. The third King Jigmye Dorje Wangchuk ordered the construction of the Mongar Dzong and in accordance to the Dzong tradition, no nails or drawings were used in its construction. A visit to the Mongar Dzong is best planned in the month of November when the grand week of Mongar Tsechu happens (refer to page on Bhutan Festivals). A distinguishing feature of the Mongar Dzong is its two entrances (most dzongs have only one). there are 4 lhakhangs inside and the most important amongst them are the Sanjay Lhakhang and the goenkhang (chapel for deities). Unlike most other Dzongs, the Mongar Dzong is perched on a gentle slope and not on a steep cliff. It’s possible to reach the Dzong in about 30 to 40 minutes if you are staying in town. The Zhongar Dzong was known as the power hub of eastern Bhutan and it spreads royally over 8 acres. The ruins of the Zhongar Dzong are a tribute to the mastery of ancient Bhutanese builders and the talent of the renowned craftsman Zowo Balip. If you are travelling along the East West Bhutan highway, you will cross the valley village of Truethangbi and from here the magnificent ruins of Zhongar dzong are visible. In the 17th century, the Dzong was built at a spot where the famous architect Zow Balip discovered a holy white bowl. A visit to the Zhongar Dzong will take you back in time because of its strange mystical quality. For photographers, this is one of the best locations for a dramatic medieval style photo shoot. The Dramtse Lhakhang is one of the oldest structures in Eastern Bhutan. 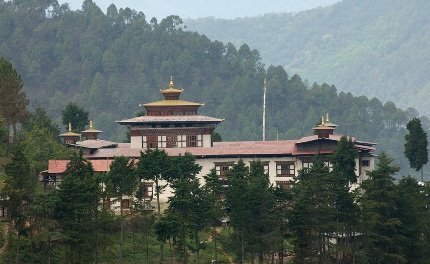 It was built on the orders of Ani Cheten Zangmo who was the daughter of Terton Pema Lingpa. This Lhakhang inspired the fluidic movements of the Dramtse Ngacham or the dance of the Dramtse Drums. The UNESCO World Heritage has noted the importance of this rare dance form on their list. The dance performers of the Dramtse Ngacham are commoners who don exquisitely embroidered brocade and silken robes and put on the masks of many deities. 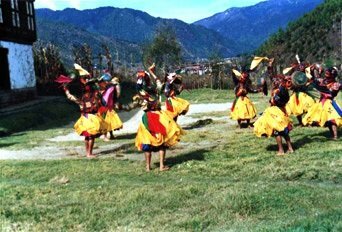 The dance mimics the activities of the Buddhist heaven Zanglo Peri that has magnificent copper mountains and is the heavenly abode of Padmasambhava. Aja Ney is one of the prominent places of religious importance and is supposed to have been specially blessed by Guru Padmasambhava. It will take two days to trek from Serzhong village to Aja Ney and many avid trekkers love this trek that combines religious experiences along with natural beauty and an introduction to the rural life of eastern Bhutan. Pilgrims from all corners of Bhutan come to visit the Aja Ney and see the rock on which the 100 different renditions of the letters Aa are carved. This rock was discovered by the Bhutanese spiritual Guru Padmasambhava. The youngest son the great Terton Pema Lingpa commissioned the building of the Yagang Lhakhang in 16th century. The Lhakhang is situated in a very small village right next to the town of Mongar. The style and the design concepts along with the principal architecture elements were all inspired from the Kupijitsam Lhakhang in the village of Yangneer in the district of Trashigang. The Lhakhang is revered by the local people for its power of warding away evil and making life easy for local inhabitants. The Jarung Chorten is built on the inspiration of the Jarung Khashor Choeten which is a famous religious monument of Nepal. This Chorten is picturesquely located in Lingmethang next to the bridge that spans the Kurichu river. This paper factory is a philanthropic donation by the late Ugyen Dorji who was the chairperson of Tashi Group of Companies and a NWAB well-wisher. The local communities linked to the Ugyen Dorji Factory have been earning their livelihood making exquisite quality paper since the last few decades. While the paper factory is not as large as the Jungshi paper factory in Thimphu (this one is family owned), you can get a good overview of the paper making process from the local paper artists. Daphne plant is used to produce dark and strong paper with a raw finish while the paper from Edgeworthia is delicate and whiter and this is a difference that’s immediately recognisable when you view the paper products. Lemon grass is an important ingredient of aroma therapy and it drives away stress, boosts positivity and is a mood lifter. The zesty fragrance of lemon grass has always been one of my favorites and I was happy to find out that Mongar is one of the principal producers of lemon grass essence due its large Chir Pine reserves and gravelly terrain. The lemon grass distillation unit at Pahadung in Mongar is a Food and Agricultural Organisation initiative funded by the Royal Govt of Bhutan. The best quality lemon grass is found in Drametse from where it is brought in to the Mongar distillation unit. There are plans of selling Palmorosa grass oil, citronella and Basillicum (all-important aromatherapy ingredients) from the distillation units. Recently a small lemon grass distillation unit has been started along the Trashigang-Mongar highway i.e. Zangpong. A visit to this area will also let you experience the beautiful fragrance of lemon grass as it grows there profusely. When in mongar, buying a bottle of locally sourced lemon grass essence should be on your priority list. You can opt to visit the Lemon Grass Oil Primary Cooperative that’s in the village of Sherichu in Dramitse Gewog under the Dzongkhag Mongar to get a detailed idea of how effective utilisation of natural resources is used to produce livelihood for rural inhabitants. This park was formerly known as Thrumshingla National Park and it spans more than 900 sq. km. Ornithologists and bird watchers will be delighted to know that along with 341 species of birds there are more than 6 species of threatened birds that dwell in this national park and they include the rufous throat wren babbler, rufous necked hornbill, beautiful nuthatch, satyr tragopan, chestnut breasted partridge, Wards trogon, wedge billed wren babbler. The park commands beautiful views of sub-tropical and alpine forests against the craggy mountains. 68 mammalian species live here including black bear, red panda, capped langur, Himalayan black bear, Malayan giant squirrel. Bhutan’s highest elevation motorable road…the Lateral Road bisects the Phrumengsla Park making it an excellent tourist destination. The World Wildlife Fund is responsible for maintaining operations in the fund. Almost 11,000 people live peacefully in the Phrumsengla area demonstrating a near perfect example of the harmonious relationship that man and nature can share. The best way to enjoy this park is to trek through it or go on a short hike. Some popular mountain trek routes are the Bribdungla an Rhodungla Mountain trek and some low altitude trek routes are Latongla Trek and Kheng Shingkhar trek. The National Highway treks from Ura to Gezamchu and Lirigang to Lingmithang are 5 hours each and are meant for amateur trekkers. The ideal season for trekking is between April to June and September to November. You can also camp inside the Trhumshingla National Park for a couple of days (talk to your tour operator) …. there are spots inside that birders describe as the best birding area in Asia. Every Sunday, farmers and nearby villagers congregate at a place near the new park to sell fresh produce. If you have missed seeing the weekend market at Thimphu and Paro, then a trip to the Mongar weekend market might be fun. You will see eggplants, potatoes, bananas, mushrooms, fiddlehead ferns etc. 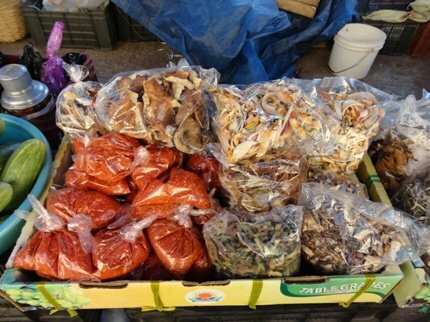 You can also shop for the famous Bhutanese red chillies. There are many places you can explore around Mongar if you love hiking and trekking. 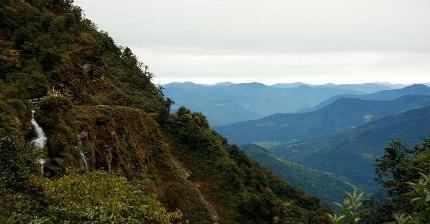 The Shami Goenpa Pongchula Circuit will take around 4 hours by foot/ 45 minutes by car. You will see a wonderful farm at Phejur Laptsa along with an excursion to Shami Goempa that commands a great view of Wengkhar valley. The Larjap hike takes 90 minutes (uphill) and 60 minutes (downhill) and is a level 2 hike. Explore the beautiful open meadow of Chompa and then climb up to the hermitage and the meditation centre which overlooks a stunning mountain flanked gorge. Wengkhar Lhakhang excursion is a 50-minute easy hike and you can explore the antique 3 storeyed wooden temple along with visit to the birth spot of the 3rd Zhabdrung. Korilla Nature Trail is a two-hour hike of medium difficulty where you can explore a 5.6 km nature walk that’s teeming with exotic flora and fauna. Bird watching and picking the famous fiddlehead ferns are other attractions. The Chali Village hike is Level 2 in terms of difficulty and takes several hours. The hike goes in the direction of Lhuentse and then to Dechencholing Lhakhang and then to the quaint village of Chali. You can choose to explore the nearby Geogs and the local school. Spending a day lost in the verdant green forested valleys of Yongkhala is a great option if you are a nature lover visiting the eastern part of Bhutan. In case you are an avid birder, photographer or an ornithologist then Yongkhala must be already familiar to you... it is one of the best birding areas in the whole of Asia Pacific region. There are beautiful species of birds in this zone namely the Rufous necked hornbill, Golden throat barbet, Collared treepies, Golden breasted Fulvettas, Scarlet finches and Ward’s Trogons (there is a beautiful lodge named after this bird…check the where to stay section). There is a good population of golden capped langurs in this area. You can have lunch at the Trogon’s Villa. If you are a serious birder, then staying overnight in Yongkhala is a must. If you travel from Yonkhala towards Bumthang, you will reach Sengor that’s also a great birding area. The area is also full of beautiful flora and if you are lucky you can spot rare Himalayan black bear, barking deer, warblers, babblers, sunbirds etc. there is a fully functional camping site in this area where you can stay. If you are in Mongar and have no plans of travelling further east towards Trashigang then at least keep aside a day for visiting the beautiful town and textile hub of Lhuentse. Lhuentse is 70 km away from Mongar (it will take you 2.5 hours to reach). Pack a lunch with you as there is a dearth of good dining places there. The views and the landscape are stark and beautiful with an eerie unsettling quality about it. Lhuentse is the weaver’s hub of Bhutan with the Khoma village being extensively promoted by the Bhutan Government as a medium of showcasing the wonderful magical yarns woven by the local women. 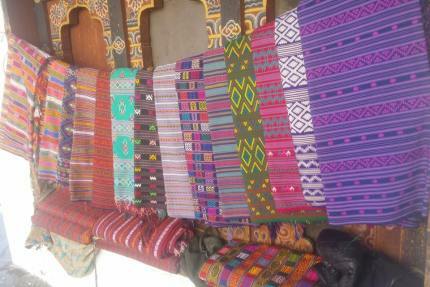 The textiles produced in Lhuentse are colorful and filled with intricate patterns… you can get these at cheaper rates. The opportunity to watch the local women at work weaving on their yarns is a unique opportunity. The Lhuentse Dzong which can be approached by a relatively comfortable stone path is also a must see in Lhuentse. Over 100 monks stay in this Dzong that was set up by the son of Pema Lingpa… Kunga Wangpo. You can also check the Kurtoe region… it’s famous for being the ancestral home of the royal family of Bhutan. In case you do not have a packed lunch, dine in at the Lingkhar lodge (basic Bhutanese food). Mongar is mostly frequented by nature lovers and hikers so most people prefer staying in the outskirts of the town. There are mid-range hotels, guest houses and home stays in Mongar so do not expect five-star standard accommodation. Most accommodation options are reluctant to accept cards and there are few ATMS around (Eastern Bhutan is relatively cut off) so make sure that you carry plenty of cash. If you cannot really adjust without touristy hotel type accommodation, then Wangchuk hotel in Mongar is perhaps your only option in this area. The food, service and facilities are all commensurate with a decent 3-star hotel in Paro/ Thimphu. The Wangchuk has free decent speed Wi Fi and that is a blessing in Eastern Bhutan. Some of the rooms in the Wangchuk Hotel overlook the Mongar Dzong… try staying in such a room. The dining area is pretty and dining outside on the pleasant terrace is also a good option. There are 32 rooms and the tariff for the standard twin room is 3500 NU while that for standard double room is 400o NU. The deluxe room tariff is 4500 NU (only 4 such rooms are available). This hotel is owned by the famous Wangchuk Group who are famous hoteliers and this is easily the most touristy and comfortable staying option in Mongar. The rooms are nicely color themed, have comfortable furniture, air conditioning, mini fridge, coffee maker and even an electronic personal safe. This is a lovely villa modelled hotel on the hill side in the middle of the stretch from Namling Brag to Limthang in Mongar District. This is known as the best birding zone in whole Asia Pacific region and on offer are great views from all the rooms. Most of the rooms are very big (too much so) and are scrupulously maintained. The amenities are also adequate though there seemed to be a dearth of housekeeping staff. The washrooms are well stocked with toiletries and there is a good supply of hot water. Incidentally, the owner of the Trogon Villa is a birder and he has a huge collection of photos and videos on rare Bhutanese birds. This would make the hotel a very appealing place for ornithologists, bird lovers and naturalists. The manager is also a trained birder and he will happily guide you about birding expeditions. There is an organic vegetable garden outside and most of the food is prepared using freshly plucked vegetables. The food is a fusion of continental and Bhutanese and is invariably delicious. The staff will happily customise meals so that’s a bonus. There is nothing very remarkable about this hotel apart from the fact that it’s one of the more luxurious accommodation options in a remote place like Mongar. Food and service are both acceptable and the hotel keeps good standards of cleanliness and hygiene. There is a total of 22 rooms including a semi luxurious presidential suite (tariff 5000 NU per night) and 1 suite (3200 NU per night) with the rest being deluxe rooms (2900 NU) per night. All rates do not include 20% tax which is extra. The suites have lovely balconies, bath tubs and giant dressing areas. All rooms have room heaters, cable TV and other comfortable facilities. This lodge was renovated in 2011 and the facilities are expanded now. Most rooms at the Shongar are quite nice and there are suites with separate living and sleeping areas. The bathroom is quite spacious, has nice tiling and there is a mid-sized shower-tub combination. The food is quite good and they serve good quality continental, Bhutanese and Indian food. Unlike most other lodges and hotels, the interior color scheme is not bright red and oriental colors... it’s a soothing powder blue. The tariff per room per night is about 1500 NU plus taxes. This Hotel is situated in Mongar town and is a decent option for travellers who are looking for an overnight accommodation in Mongar. The amenities are all basic like attached bath, choice between twin beds and double beds, centralised room heating, room service and cable TV. The hotel has only ten rooms and the tariff is extraordinarily low at just 700 NU. Only 10% tax is levied. This is one of the best localised accommodation options that’s situated on a shopping plaza floor with private washrooms and corner balconies. This pretty café and farm house is just 45 minutes away from the Mongar Dzong and the drive is very charming. You must follow the main road till you see the Yozer Farm House Sign Board and from there the diversion will just take two minutes till you reach the farm house. Once inside, you will be bowled over looking at the antique style furniture and the beautiful paintings and local craft items inside. This farmhouse is more than 25 years old and the present owner’s family will happily explain the nuances of farm life as well as point out the different aspects of the house. There are 3 bedrooms which are prettily furnished and have attached washrooms. Comforters, hot water supply, central heating and pleasant facilities are provided. The tariff is between 1800 NU to 2000 NU. On offer are a host of activities like learning weaving, archery etc. (incidentally gender boundaries are a little rigid as in weaving is meant for women and archery for men). Birding trips, nature walks and sightseeing trips are also arranged. Dinner times are lovely with all guests being invited to dine with the hosts family. The menu is delicious though essentially Bhutanese. Incidentally, if you don’t want to stay this far away from town…you can at least visit for a tour of the farm and a cup of tea along with steaming momos. The experience is sure to be pleasant. Mongar doesn’t have too many great restaurants and cafes though you would get ample choice of cuisine like Bhutanese, Indian, Chinese and Continental in the hotel you choose to stay in. However, there are a couple of restaurants that you can check out while you are in Mongar. These places do not take cards so make sure that you carry along plenty of cash. This is a quaint little restaurant in the heart of Mongar town. The menu is quite extensive and well sketched with lots of Tibetan, Bhutanese, Chinese and Indian items (not all items are available though). The momos and chicken chilly are quite popular so you should try them. The owner of the Lotus Pond Restaurant is into manufacturing lemon grass oil too so you can pick up a bottle while you are here. The restaurant opens early….at 8 a.m. So, you can hop in for breakfast…they have a basic yet delicious selection of breakfast items. This little roadside restaurant and bar is a good place to try out the Bhutan national dish Ema Datsi along with other favourites such as Suja, Pork momos, Beef Stew and Spinach Datsi. There is a good collection of local and some International liquor brands. Opt for the set meal (priced at 450 NU) which has red/ white rice, lentil soup, mixed vegetable, ema datsi, chicken curry and pickle along with ara/ suja. The food and service are both good. Arguably, the best bakery in Mongar… the Puensom will have you hooked. Where else in Bhutan will you find decent quality Rasgulla (cheese balls dipped in sugary syrup… a delicacy of Eastern India)?? You will also find deliciously fudgy and warm donuts, pizza (limited varieties), apple pie and chocolate eclairs. Their Daily Specials keep on changing so make sure that you ask around for what was baked fresh today. The cakes are quite delicious and range between NU 50 to NU 150. The pizza starts from NU 50 (per slice).